Interactive algebraic systems with chemical compounds. 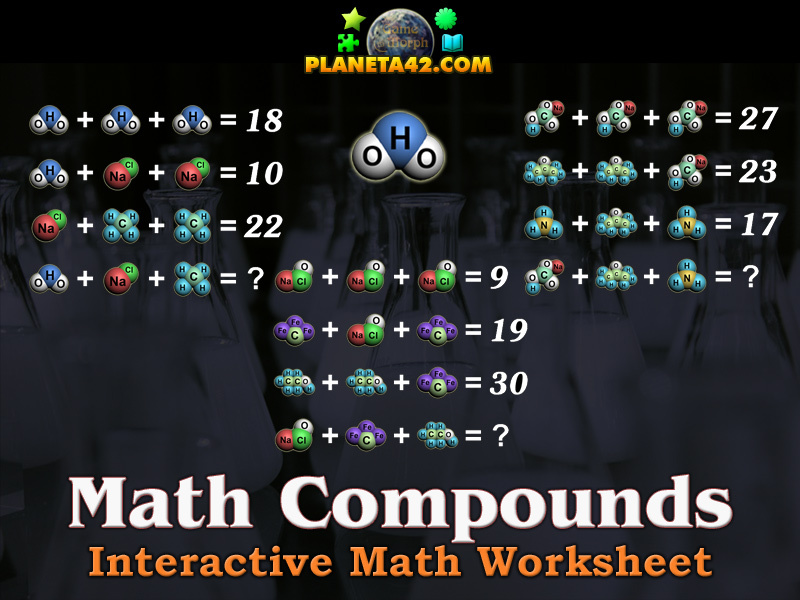 "Math Compounds" is a free online game to study and solve popular algebraic equation systems with compound pictures of popular chemicals used in every day life. Find the missing number in the last line of the combinational chemical compounds equations. Math learning game, suitable for online lessons and interactive classes. Interactive algebraic system. Fun educational math game. The Math Knowledge Board include 3 mathematical frustration puzzles with chemical compounds to solve. The game is part of the Interactive Math School educational tools. Fun math quiz for all ages. Test for the smartest. Water + Salt + Methane = ? Soda + Acetone + Ammonia = ? Bleach + Steel + Ethanol = ? Program code and pictures by Ogo Bob. How to play Math Compounds. You get 4 combinational lines of chemical compounds and the sum of the first 3 lines is shown on the picture. Your task is to solve the last line, where you need to do simple addition, division, multiplication or subtraction. When you are done, enter your answer in the imput field with the question mark and press Enter. You must solve all 3 mathematical frustration puzzles to win the game and get a Knowledge Level. This is another example of combination system equation with overall 3 unknown values that have been very popular lately. To solve it we need simple math and logic skills. The first line usually consist of 3 same popular chemical compounds. So we need to divide the number at the end of the equation by 3 to find the value of the first compound. The second line include always one of the first chemical compounds and another two same chemical compounds. So we subtract the value of the first compound from the number at the end of the equation and then divide the result by 2. Now we have the value of the second compound. The third line include one compound from the second line and again two new chemical compounds, but in different order. Then again we subtract the the value of the second compound and devide the result by 2. When we have the values of all 3 chemical compounds, the last fourth line is to add them to one another by simple addition and find the missing number. 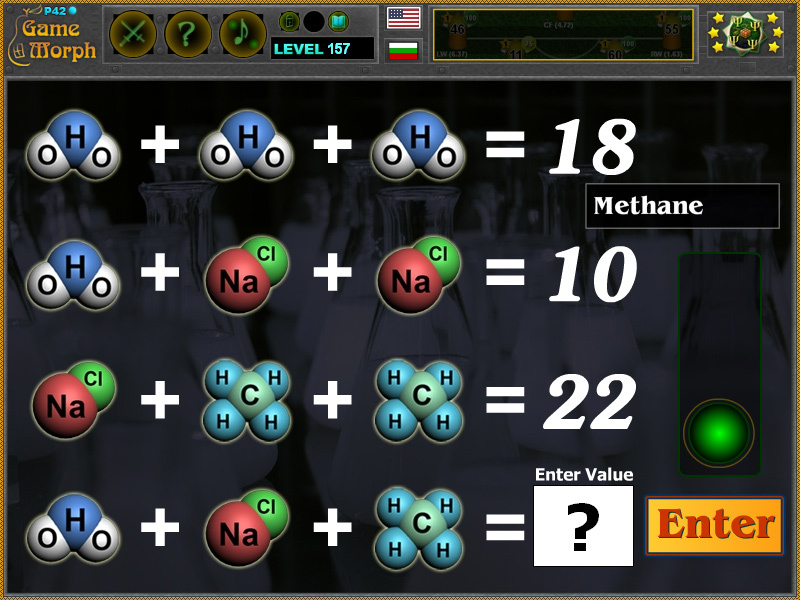 This app include the following chemical compounds: Water, Salt, Methane, Soda, Acetone, Ammonia, Bleach, Steel and Ethanol. Labels: Math Games , Classroom Games , Chemistry Games , Online Tests , Interactive Math Worksheets , Free Online Games.